Hemel Storm vice-captain and forward Tom Adorian. Hemel Storm’s vice-captain Tom Adorian has issued a rallying call to fans ahead of Saturday’s crunch National League Division One home clash with Thames Valley. Adorian appealed to the Storm-Troopers to come out in force and help his team defeat a big and talented fifth-placed Cavaliers side who knocked off the league leaders Solent Kestrels last weekend. The Cavaliers feature in their line-up former Storm favourite and captain Walid Mumuni, who will return to Hemel Leisure Centre for the first time since his move in the summer. Hemel lost 86-82 to Thames Valley in the reverse fixture back in October. With no game last weekend Hemel have slipped into one of the two relegation spots in 13th place but still have 15 games to turn it around. The squad held a team meeting last week to study their performances to date and set challenging goals for the remainder of the season. Storm’s all-British squad has struggled at times this term against opponents with imports from America and Europe but are now on a good run of form having won their last three games. Hemel beat Derby and Manchester in the league and secured a thrilling National Trophy pool game win the previous weekend at home against Essex Leopards when the fans at Hemel Leisure Centre played a big role in the win. Storm were ahead by a point when with 0.6 of a second left the visitors’ standout US import Asante Sandiford was awarded two free-throws to potentially tie or win it. Both free-throws were missed and it was Adorian who secured the rebound for a nail-biting 96-95 victory. “I think our fans played a big part in that victory,” said 6ft 9ins forward Adorian, in his seventh year with the club. Hemel are in their seventh season in the NBL’s top flight and have qualified for the end-of-season playoffs five times, twice finishing in the top four. Saturday’s game tips-off at 7pm. n Hemel Storm’s second team were in action on Sunday but suffered a second straight league loss 53-61 away at Anglia Ruskin University. Hemel managed just five first-quarter points against a robust defence to leave them trailing by eight, 13-5, but the home team struggled against Storm’s defensive changes in the second period and the visitors clawed back to trail by only three at half-time. Storm ll remained strong defensively throughout the second half. Anglia’s offence sputtered against the visitors’ pressure while the rebounding was dominated by Hemel’s forward line, veteran Rafe Abrook grabbing 15 boards. Mid-way through the final period Hemel’s comeback was complete and they edged into a five-point lead. But it was short-lived when on consecutive plays Anglia connected on desperation three-pointers as the shot-clock expired. Head coach David Allin said: “It was incredibly frustrating not to get the win. “I felt we were on the wrong end of some tough calls at critical points in the game but still did a fantastic job to drag ourselves back into it. Storm ll team and scorers: Nick Allin 16, Lewis Castro 9, Rafe Abrook 8, Mike Coumas 6, Shaun Allin 5, Craig Percival 5, Daryl Craine 4, Dominic Charles. 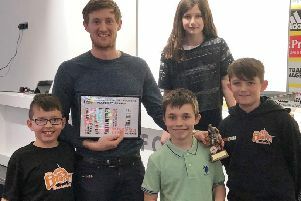 n Storm players joined fans for the annual family quiz night on Friday at Watford FC’s The View suite in The Graham Taylor stand. The venue was packed for the fundraiser and Storm’s popular forward Leome Francis led his team, Hogwarts School of Quizadry, to a close victory to secure the 2018/19 quiz trophy. “It was a great event,” said Francis, “and an opportunity to get together with our fantastic supporters away from the tension of a game. Francis’ Storm team-mate Leon Henry and his group, Leegetsnobuckets, had the dubious honour of collecting the wooden spoon.